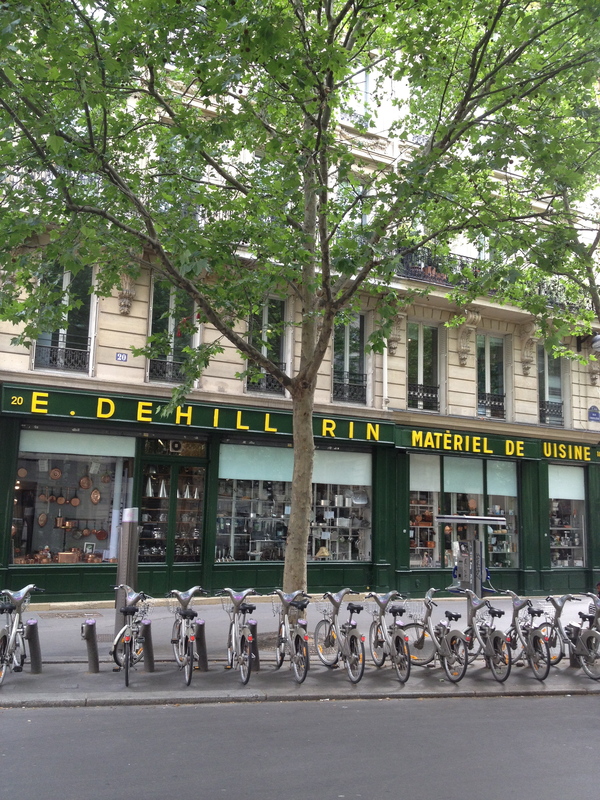 As today is mlle Cordon-Bleu’s graduation from her pastry program, I thought I would post a few pictures of my favorite cooking supply store here in Paris, E. Dehillerin. 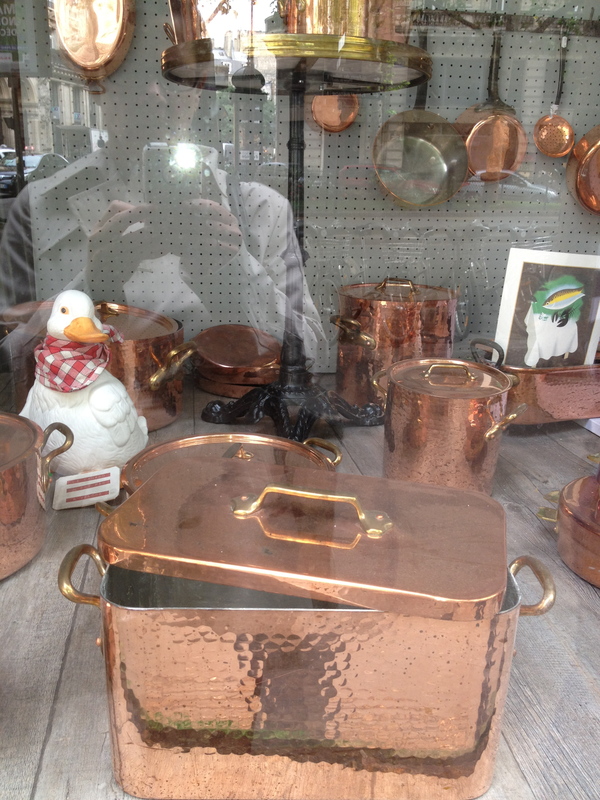 This family owned business has been supplying cookware to the trade since 1820, and some of the things in the windows looked as if they hadn’t been dusted since then. True foodies are undaunted by such details, however, and once inside this small space stacked high with culinary treasures, the rest of the world is forgotten. Two narrow staircases lead down into the basement, where I was the only one poking around the piles of pots. Some of those pots seem to have been made for bathing babies in- they were enormous. Upstairs, the copper selection is amazing. There are also endless knives and cooking utensils, many of which I would have needed instruction on how to use. I bought a very handsome spatula and a slotted spoon for myself, and a graduation treat for my favorite Cordon-Blue baker. 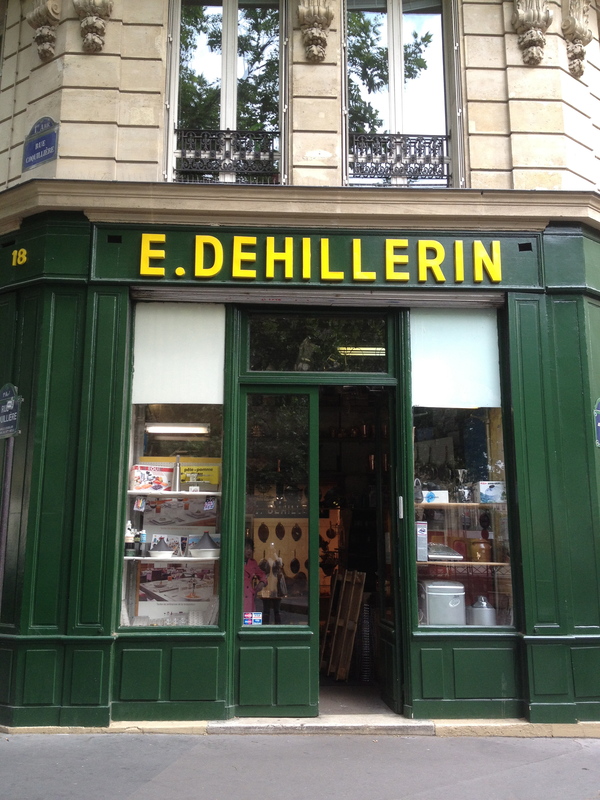 I wanted to buy a rolling-pin, too, but saved it for another day. I’ll be back. how much is that pot in the window???? Kate: I’m ready to go rolling pin shopping when you are! This is on the bucket list and I have yet to visit. YOu will love it. 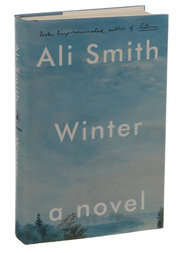 Unfortunately, I am out of time until I return in September. Wah! We’ll go together then for sure. Our congratulations to Mlle Cordon Bleu – Houston looks forward to welcoming her home! Josh just used my E. Dehillerin rolling pin this morning to make Homesick Texan sausage, cheese and jalapeño kolaches!! Never made those but would love to give them a try this summer! Were they oh so good? Can you decipher what the clerks are muttering while you point to all sorts of items high on the shelves? Remember the scathing comments made about the American last April? I need some wooden spoons for spanking… i mean stirring. Summer…ahhhh. Of course I had forgotten all about that. Yeah, one doesn’t shop there to be fawned over by the staff.